The handle on this dirk I carved with a gain twist which makes it look like Unicorn horn. Of course you must be pure of heart to see Unicorns. I see them all time in the fields so I run out there and de-horn one of them for a handle. 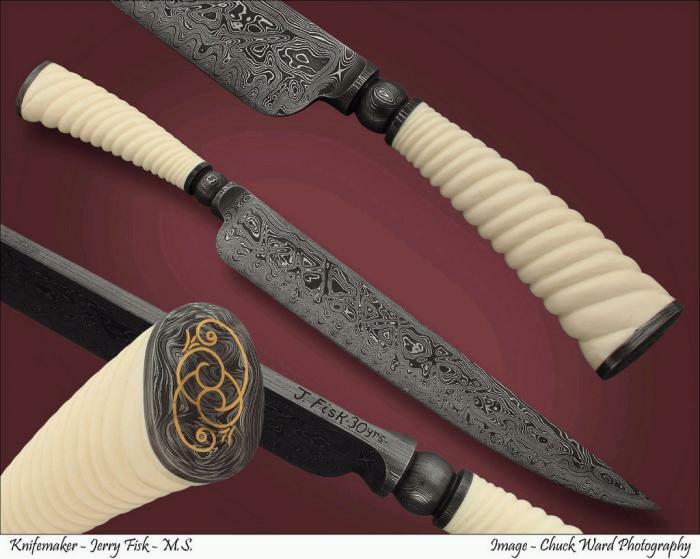 The Dirk is the most copied and modified knife in history. Gain twist fluting is the most difficult twist style fluting there is. The only way that I can do it is sit down with couple of metal cutting files in hand and start filing the ivory till you get what you want. Thats why you do not see much of it, it is too time consuming. I think you should expect the best from your knifemaker. This one was marked with a 30 year marking. Every five years I mark a few knives.